A New York state panel will publicly mull a proposed wage boost for fast food workers for the last time Monday before making a final recommendation on a new industrywide pay rate later this year. The meeting in Albany, New York, comes on the heels of four public hearings earlier this month, forums that have pitted large contingents of employees, labor advocates and elected officials asking for a new $15 hourly minimum against smaller, critical bands of business owners and restaurant operators. Ultimately, the panel’s decision will help shape the future of a low-paying pillar of the modern American service economy. Roughly 180,000 New Yorkers work in the fast food sector, most of them earning near the current state minimum wage of $8.75 an hour. A final decision isn’t expected until July, according to the Daily News. Nevertheless, Monday’s meeting could reveal insights into where the panel is leaning after taking in nearly a month’s worth of testimony. Using a state statute that allows regulators to hike pay in specific industries without legislative approval, Gov. Andrew Cuomo impaneled the Fast Food Wage Board last month. Its three members -- Buffalo Mayor Byron Brown, who represents the public, Kevin Ryan, chairman and founder of online shopping company Gilt, who represents business, and Mike Fishman, secretary-treasurer of the Service Employees International Union (SEIU), who represents labor -- are charged with proposing a new pay rate to the state’s Department of Labor, which can then accept, reject or change the recommendation. 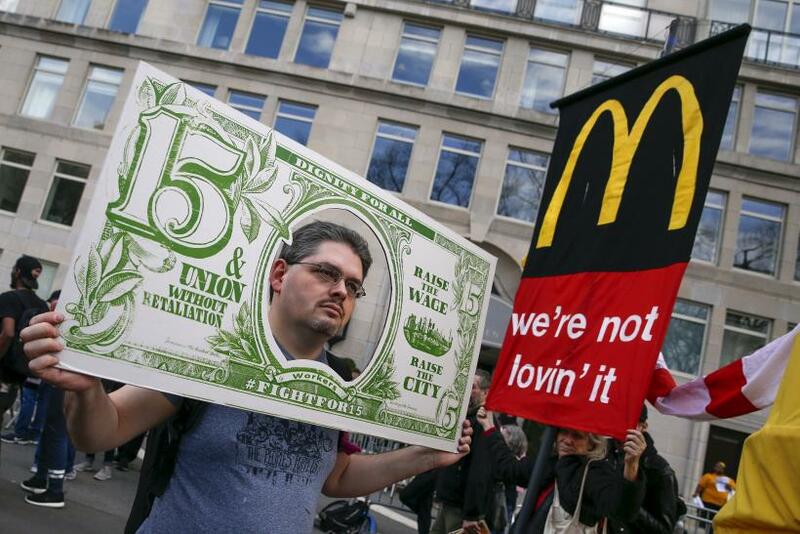 Amid a string of minimum pay hikes nationwide -- most recently in Los Angeles -- labor unions like the SEIU, which has poured millions into organizing high-profile fast food worker demonstrations, have asked the panel to set a $15 hourly rate. More than a hundred elected officials, including 19 New York City council members, signed a letter to that effect Monday, sent to the wage board, the governor and the labor commissioner. Supporters also say that a sizeable pay raise will help stimulate the economy, as low-paid workers will spend -- not save -- much of that newfound cash. Critics say $15 an hour is a step too far, with some restaurant owners warning they’ll be forced to lay off workers or raise prices.